Fits MAZDASPEED3 ONLY. Includes fabricated passenger side mount, fabricated transmission mount and fabricated lower dog bone style mount. Save when buying as a kit. Choose your durometer as a kit. 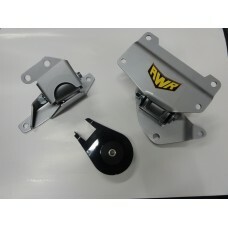 All three of the mounts in this kit are fabricated steel units laser cut, CNC folded and Tig or Mig welded for the durability and strength you expect from AWR. All are powder coated silver to give them that professional appearance. All mounts use nickel plated inner sleeves and Energy Suspension Urethane bushings.